Enjoy the rest of your Monday and Tuesday with the tease of spring. I am filling in for Bill Kelly tonight. Clouds increase later Tuesday along with the unseasonably warm temperatures. All models staying dry all day Tuesday. I went with 62 for the high... with the cloud cover it may be harder to punch much higher, but with a high of 61 today, I am half tempted to go up to 65, but sticking to my guns for now. Early Wednesday morning we are still expecting a strong cold front to bring a wintry mix. Rain looks to move in around 1-4AM Wednesday. RPM (the very top image in this entry) and NAM have most of the system out of here before we cool off for much snow. GFS and Euro are much more aggressive with the cool down and switch us to snow by 8-10AM. Right now I am leaning toward the RPM and NAM. 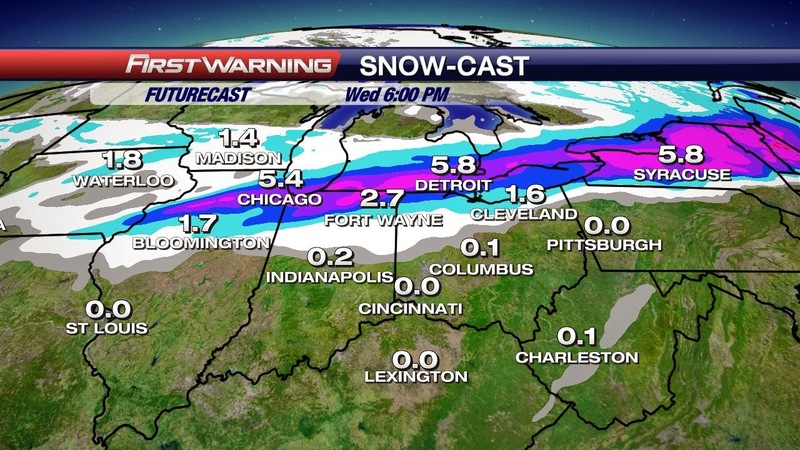 The last few systems, RPM has nailed the snow forecast 24 hours out and right now it is keeping us too warm. I attached my thoughts on how much snow we can expect. It will likely come down to a game-time call on how cold the temperatures get and how much moisture is left behind the system. The models are staying steady with two rounds of light rain/snow mix later in the week/weekend. The GFS and Euro agree on Friday evening and overnight into early Saturday for round 1. The second round is Sunday night into Monday. GFS is more late Sunday and Euro is more early Monday with the timing. Both will be on the threshold of the rain/snow mix as well. And so the battle to get to spring continues... Have a good one!